Woods Bagot Architects designed the headquarters of Westfield Corporation drawing on a vibrant CMYK-based colour palette that contributes to a creative, positive and stimulating work environment. The three floors are connected by a staircase, including a café and open plan working areas as well as enclosed meeting spaces, conference rooms, and group collaboration areas are also key features in the Westfield Corporations. These spaces are separated by using directionally transparent and translucent partitions by Bencore. 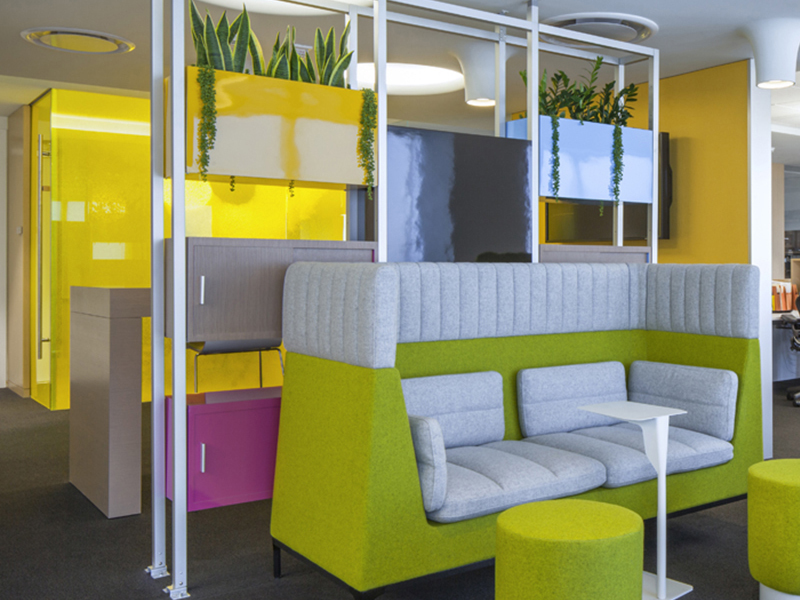 The architects selected the transparent facing colours for each partition system to enhance the overall colour palette of the office, making it a bright space for employees. Translucent honeycomb panels work well for shared spaces such as meeting and conference rooms as the tubular core provides directional transparency to let in more light and create an airy feel, while offering some privacy and sound shield. The lightweight composite sheets are installed using a prefabricated, frameless partition system with translucent interlocking joints that eliminate vertical framing, and reduce installation time. While they are not only practical, they are also a beautiful addition to any interior. The aesthetic options are varied, with a range of options in core material, cell shape and size, colour, finish and facing to choose from.